Xenomachina: Soda-Pop vs. Coke == Blue vs. Red? Soda-Pop vs. Coke == Blue vs. Red? If you want to see an even more striking similarity, compare that same Pre-Civil War Free vs. Slave States map to the Soft Drink Names by County map, available from The Great Pop vs. Soda Controversy website. So what's going on? A conspiracy? More likely there are simply cultural differences that, for whatever reason, have persisted since the civil war. The claim that these differences are a result of a latent desire to reinstate slavery is revealed to be more than a bit silly when you start talking about what people call soft drinks, rather than who they voted for. yes i agree, that s strange data.. 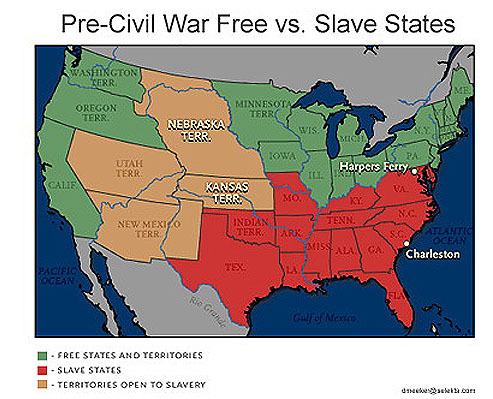 The more correct reason for the civil war was state rights vs a stronger federal government. Which shows how this notion persists in red states vs blue states. Anonymous: I don't think I ever stated a "reason" for the civil war, so I'm not sure what you're referring to. That said, I'm not American, so I never took American history.